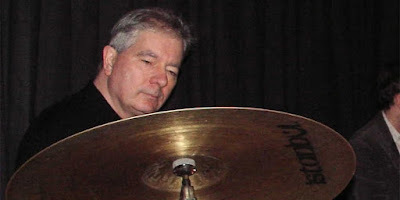 The news that drummer and club owner Bill Kyle has suddenly passed away has hit the Scottish jazz scene with a sense of real shock, because of the massively positive effect that he has had on so many of our lives. I first met Bill on the first day of the Broughton Jazz School in 1982 - I was 15 and had gone along with my brother Phil and two of the other students who walked in (also 15) were Tommy Smith and John Rae. Bill was warm and supportive as a drum teacher. He had studied and played in the US, was an older Scottish jazz drummer who was doing it and telling us how to get better. It is hard to remember how different Scottish jazz was then to the way it is now. Most Scottish jazz musicians then - especially those who wanted to play more progressive jazz or play their own compositions - had to leave - whether Bobby Wellins or Maggie Nichols. Bill, along guys like Brian Keddie and Gordon Cruickshank , was very active playing original jazz fusion with his band Head, bringing over American jazz musicians like Joe Locke and Steve Slagle in his band Atlantic Bridge. He was also instrumental in building a Scottish jazz infrastructure by setting up Platform - a funded touring network. Bill worked in IT and used his savvy in 2002 to open the Bridge Jazz Club in Edinburgh, where he played regularly as well as hosting all of Scotlands musicans as well as many international visitors - most notably when Bill played several gigs with Lee Konitz. Unbelievably Bill’s club burnt down after 7 months in the fire of 2002 - actually during a gig (full story HERE). Bill picked himself up, and in 2005 opened the now legendary Jazz Bar which has been an oasis of live jazz activity to this day with Bill the same warm, undemonstrative supportive guy coming in early to practice on his Grestch kit before the club opened. And Bill respected, valued, and put on, every kind of jazz from free improv to dixieland to funk. No jazz life is easy, every jazz life is on the fringe, and a jazz life in a smaller scene like Scotland is like a fringe of a fringe. In Scottish jazz it isn’t easy to balance supporting and investing in the people around you with the desire to work with people who excite you from the wider amazing world of jazz. I see younger Scottish drummers looking at me now the way I looked at Bill back in 1982 - I am glad you are here but the guy I really want to study with is X. For me X was Elvin Jones and now X is probably Eric Harland or Antonio Sanchez. That is the way it should be. But the scale of the sense of loss that the musicians in Scotland are feeling right now clearly demonstrates how Bill was one of the very few people in Scottish Jazz who managed to get that difficult balance right - between investing in the potential of the local whilst looking out at the world. He made musicians based here, at all levels, feel supported and valued, as well as welcoming great musicians from round the world and treating them with respect. The way he gave Snarky Puppy their first gig in Scotland when they were unknown meant that when they came back and played a bigger venue they invited the entire audience to go to Bill’s club for a jam - which they did for free to support Bill. Despite areas of health and vigour arguably Scottish Jazz isn’t in a great place right now, partly because of the lack of a coherent jazz funding strategy that amongst other things could (and should) have supported Bill more consistently in putting on funded gigs and developing viable touring options built on the success of his self-supporting club. So Bill’s loss feels like a more severe blow given where we are and what a essential role he was playing. Hopefully as a scene we can learn from his example of a Scottish jazz life, which in the way he never stopped loving the music, never stopped pouring positivity and love into our flawed but compelling scene, whilst respecting the rest of the jazz world, was genuinely quietly magnificent. Last time we met in London, last March, Bill was back from a business lecture he gave in some university. We joked about making money with jazz, but having seen the current Jazzbar from the very beginning (I just popped in for a jam and I found a new friend), and having played there every couple of years, I've seen how Bill built the music scene around it. He told me about the 10th JB anniversary and the enthusiasm around it. If you check the program, it seems incredible that so much music can happen in one place. Bill loved music, he grew an audience, he had (according to his own words) the most amazing team at the Jazzbar. I like to think that his legacy and his enthusiasm will go beyond the Jazzbar and Scotland. He is the example that things can be done against all odds. Thank you, Tom, for taking the time to compose this insightful, articulate and respectful piece about Bill Kyle. Bill, by inviting me to play with him in Scotland back in 1987, opened the door for me, not just to the UK, but also to the European continent. So many of the fruitful musical relationships I've had over the years with my European colleagues can be traced back to 1987 and the door Bill opened. I will always be grateful. A shock seeing this.... I met Bill when he was playing a nephew's wedding (a rather posh event, I must say) and he was in the band. I'd been with Sabian cymbals, doing marketing for many years, so we chatted about gear. And I'd lived in Edinburgh, so we had mutual friends. Last time I saw him was 2012 at his club on Chambers Street. I was there to see pal Dave Swanson with Stevie Hays' Blues Band. That venue reminded me of how great it was to play Edinburgh city centre venues in the 70s...it had a real friendly 'we all know each other' vibe, even for a stranger like me. Losing Bill will surely - as everyone is noting - have a big impact on the Scottish (and UK) jazz scene, and one can only hope someone well step up to the challenge of keeping his the Jazz Bar and his other initiatives moving forward. So sad to hear the news. Someone who always thought that the staff and performers at a gig were as important as customers. Scotland needs more businessmen like him who followed his personal passion rather than profit. RIP. Very sad to hear this news today. I used to play with Bill at Cellar No1 in the late 90's. I remember his kindness and support; he used to give me a lift down to Waverley station to get the train back to Fife. I was visiting Scotland from Australia when I saw him in June this year at the Jazz Bar and thanked him for all he did for me back then. Farewell Bill and thank you.